2016 Nanclares y Prieto, Albarino “Dandelion” Rias Baixas, Galicia Spain. Beautiful pure and almost Kabinett/Feinherb Riesling like (intensity of form) with generous flavors in the mouth this gloriously delightful Albarino from Alberto Nanclares and Silvia Prieto is vivid, saline and textured with bright green apple, tangerine and peachy stone fruit on the crisp palate, with wet stones and light spices, it’s so well balanced you’d think it might be slightly off dry, but with brisk energy giving it a cat like taught muscle like focus! The unpretentious and humble Nanclares is one of Albarino’s great stars from the Cambados area of the Rias Baixas region in the Atlantic influenced Galica, his wines all from organic grapes show a leesy depth, while still being mineral driven and salty, with this Dandelion cuvee coming from 30 to 60 year old vines near Val do Salnés grown on sand and granite soils, right at sea level with locally historic pergola training. 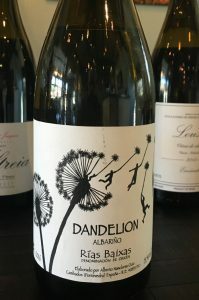 The Dandelion is fermented with native yeast, naturally, in stainless steel with no malo and aged a year on the fine lees, it is unfined and unfiltered allowing the complete capture of every nuance and terroir elements, and this 2016 is the best yet, that I’ve tried on this wine, it’s detail and varietal vitality is fantastic, especially for the price. This wine will be killer with crab this holiday season and is an amazing sea food cuisine partner, from oysters to grilled baby octopus as well as mackerel and sardines, it makes my mouth water just thinking about it! Drink it now and often, not easy to find, Silvia and Alberto have a cult following, I got my bottles from Vinopolis Wine Shop in Portland, Oregon, and it’s well worth the search as is their estate bottlings as well as is their super rare Mencia (Ribeiro Sacra) offerings, imported by Jose Pastor Selections, these are not to be missed wines from Galicia.